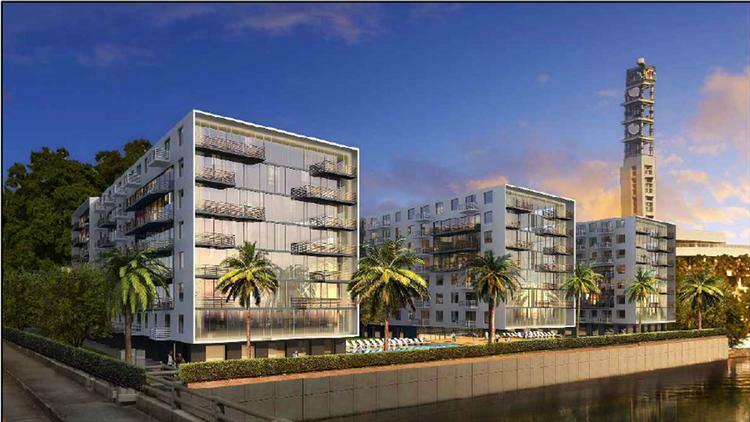 TAMPA — An upscale Miami developer has been chosen to lead the city’s signature West River redevelopment, a $500 million project intended to expand the revitalization of downtown west of the Hillsborough River. The Tampa Housing Authority’s governing board on Wednesday approved the selection of the Related Group for the West River project, which includes the construction of 1,636 condos and apartments and 177,000 square feet of retail and office space. The ambitious effort is part of a larger plan to transform 200 acres on the west side of the Hillsborough River between Interstate 275 and Columbus Drive. The area is home to the sprawling 44-acre North Boulevard Homes, the city’s oldest public housing project, and an aging apartment tower for seniors. In their place will be a mix of parks, open space, condos and apartments, some priced at market rate and some designated as public and Section 8 housing. The project will be developed under the name Related Urban Development, a venture of Related and its public-private partnership affiliate the Urban Development Group. “With a developer of the caliber of Related Urban on our team, I am very confident we can leverage these predominantly public land holdings and transform the West River area into a vibrant, walkable, transit-oriented and diverse community,” said Mayor Bob Buckhorn in a statement. Board members on Wednesday also awarded the contract for construction of two other West River apartment buildings worth an estimated $40 million each to Bank of America Community Development Corp.
Related was founded by Jorge Perez, who has a net worth of $3.1 billion, according to Forbes magazine. That description could apply to its recent Tampa projects. Among them is the Manor at Harbour Island, a 21-story, 340-unit tower planned next to Plaza Harbour Island that has been fiercely opposed by neighbors. Related last year bought the Tampa Tribune headquarters at 202 S Parker St. for $17.75 million and plans a mid-rise residential project on the 4-acre site that overlooks the Hillsborough River. The company also built the Pierhouse at Channelside. Related also has experience developing affordable housing projects, such as Collins Park in Miami, a 124-unit apartment tower for seniors. City leaders envision West River as a walkable, mixed income community that will be further enhanced by the $35 million remaking of nearby Julian B. Lane Riverfront Park, the most expensive park project in the city’s history. Under the agreement with Related, at least 820 rental units and 30 percent of the for-sale homes will be available for low- or moderate-income families, Housing Authority officials said. The agency began relocating residents out of North Boulevard Homes and the senior center about a year ago. Those residents will be given priority if they want to return to the area once the project is built. If that grant is successful, demolition of the existing public housing could begin in 2017 with construction starting the following year, Moore said. The transformation of the now-defunct Tampa Tribune‘s downtown real estate will begin sooner rather than later. Related Group, which is planning a 400-unit, eight-story residential development on the Tribune site, began removing furniture from the building this week, said Arturo Pena, vice president of development. A rendering of Related Group’s plans for the Tampa Tribune site. Miami-based Related closed on the 4.4-acre waterfront property at 202 S. Parker St. in July 2015, paying $17.75 million. The development will also include a 10,000-square-foot restaurant on the ground floor. Pena said some environmental abatement will be done next week, and that “optimistically,” demolition could begin July 1. “Realistically,” he said, it will likely be mid-July before the building comes down. The redevelopment of the Tribune site, which has dazzling views of the city skyline, could mark a new era in urban development in Tampa, driving growth on the western bank of the Hillsborough River. When Related bought the Tribune‘s real estate last summer, then-publisher Brian Burns told his newspaper that the paper would move to other office space and either relocate its presses or make arrangements with a printing company. The Tribune signed a temporary lease with Related, allowing the newspaper to stay in the building until May 1. Tribune leadership toured several office buildings in Tampa, zeroing in on four different locations and striking a deal with the Tampa Bay Times to print its papers. In the end, though, a much bigger deal with the Times was signed: The Times on May 3 announced it had acquired the Tribune and would shutter its rival immediately. The Marina Village project planned for North Flagler Drive between 38th and 42nd Streets in West Palm Beach, a joint venture between Miami developer the Related Group and West Palm-based boat repair/refit company Rybovich, is starting to take shape. The West Palm City Commission last month approved the site plan for the first of six residential towers on the 19-acre site next to Rybovich’s boat yard and headquarters at 4200 North Flagler Drive. The first building is 25 floors with 132 apartments and a four-story garage. The first phase also includes a 3,025 square-foot beach club with swimming pool and a public promenade. Construction on the first building should begin late this year, with completion expected in 2018, Steve Patterson, CEO of Related, told The Real Deal via email. The rest of the project will be rolled out over six phases with a projected completion date of 2025. In addition to more than 1,000 residential units (future buildings are slated to house condominiums), the project includes 61,500 square feet of office space and 25,000 square feet of retail space. “We aim to make Marina Village a place where residents will want to live, work and play,” Patterson said. “Our projects in urban, walkable destinations are seeing strong interest across all demographics, and we feel the trend will continue at this project.” That includes retirees, empty nesters and millennials looking for an urban environment. “There’s something here for everyone,” Patterson said. The neighborhood surrounding Rybovich isn’t a pretty sight. “The positive here is that the area has been blighted for decades, and this will stimulate redevelopment of the historic neighborhood and Broadway,” a major north-south street just west of Flagler Drive, Rick Gonzalez, president of West Palm-based REG Architects, told TRD. “The more difficult thing to accept is the scale.” It reminds him of the buildup of Biscayne Bay, he said, when he was growing up in Miami. “But you have to look at the existing conditions: they’re horrible,” Gonzalez said. “This is a compromise. It’s just a shame that it will change the character of the area. That’s the history of Florida.” But the restoration of the waterfront will be a blessing for boaters like himself, Gonzalez said. Meanwhile, he hopes the six residential buildings will have different designs, much like the buildings in the Battery Park waterfront section of New York City, to avoid a cookie-cutter look. ATLANTA–(BUSINESS WIRE)–The Related Group has selected Balfour Beatty Construction to build its new luxury, mixed-use residential tower in the heart of Midtown Atlanta. Located at West Peachtree and 14th Street, the 39-story tower will become the tallest residential tower project built in Atlanta since 2009. Consistently ranked by the Atlanta Business Chronicle as a top 5 commercial contractor in Atlanta based on Georgia contract revenue, Balfour Beatty Construction is well established in the market with deep experience serving the commercial office, K-12, higher-education, hospitality, and multi-family markets. The Related Group’s Midtown Atlanta project will feature 390 luxury apartments with 6,500 square feet of retail space. The property will feature a pool terrace with clubroom amenities and a fire pit terrace on the 39th floor. Ideally situated in the gateway to Atlanta’s Arts District, Piedmont Park and the Midtown business district, residents will also enjoy convenient access to Whole Foods Market’s planned pub, microbrewery and cooking school, in addition to a variety of neighborhood restaurants. To maximize efficiency and manage costs, the Balfour Beatty team is leveraging lean construction methods and the latest technologies to deliver the project. The building’s window wall system will be manufactured off-site, along with various other mechanical systems, to help accelerate the project timeline. The team is using building information modeling (BIM) technology to maximize efficient coordination with trade partners and to mitigate potential challenges well before installing mechanical systems or the building’s skin. Designed by architecture firm Smallwood, Reynolds, Steward, Stewart, the project is scheduled for final completion in first quarter 2018. An industry leader for more than 80 years, Balfour Beatty Construction US provides general contracting, at-risk construction management, and design-build services for a wide variety of markets, serving clients in both the public and private sectors. The company is the U.S. subsidiary of London-based Balfour Beatty plc (LSE: BBY), a leading international infrastructure group that finances, develops, builds and maintains complex building programs focused on social and commercial buildings, power and utility systems, and transportation. Consistently ranked among the nation’s largest building contractors, Balfour Beatty Construction US is ranked the third largest domestic building contractor and a top 10 green builder by Engineering News-Record. To learn more, visit www.balfourbeattyus.com or look for BalfourBeattyUS on Facebook, Twitter, and LinkedIn. The Related Group proposed building a third phase of its New River Yacht Club apartments in Fort Lauderdale, even before the second phase has broken ground. Patrick Campbell, a VP and project manager at the Miami-based developer, said the rental market in Fort Lauderdale is so hot that the company and its partner Rabina Properties want the option to come out of the ground with both the second and third phase at once. The city’s Development Review Committee will hear plans for New River Yacht Club III by Related Group affiliate New River III LLP on May 10. The eight-story project would total 184,175 square feet with 190 apartments, 1,800 square feet of retail and 337 parking spaces, including 60 tandem spaces where two cars would share a space. The 1.56-acre site is located at 416, 417, 429 and 441 S. Andrews Ave. and 416 S.W. 1st Ave. Amenities would include a pool deck on the parking garage, a fitness center, a club room, meeting rooms and a business center, Campbell said. Cohen, Freedman, Encinosa & Associates Architects designed the project. The unit mix would be 15 studio apartments, 80 one-bedroom apartments, 67 two-bedroom apartments, 15 two-bedroom apartments with a den and 13 three-bedroom apartments. They would range from 635 square feet to 1,530 square feet. The Related Group and Rabina Properties completed the first New River Yacht Club in July 2015 and obtained approval for 349 apartments in the second phase at 401 S.W. 1st Ave., the former home of Apex Marine, in 2015. Campbell said the plan for the New River Yacht Club buildings is to keep them as rentals long term. He’s bullish about the condo market on Fort Lauderdale beach, where Related Group is partnering to develop the Auberge Beach Residences and Spa. He just returned from Chicago and said wealthy buyers in the Midwest have shown increasing interest in owning second homes and vacation residences in Fort Lauderdale. 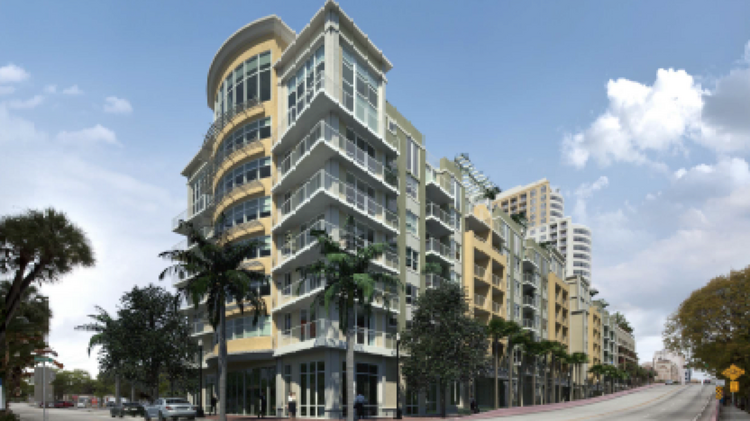 Law360, Miami (July 16, 2015, 10:22 PM ET) — The Related Group sold the Manor at Flagler Village, a 382-unit luxury apartment complex in downtown Fort Lauderdale, for nearly $149 million to an entity owned by Teachers Insurance and Annuity Association, according to records filed Thursday. The Miami-based developer finalized the deal for the property at 501-575 North Federal Highway on Wednesday, with its affiliated entity RD Flagler Village LLP selling to T-C The Manor at Flagler Village LLP, the recorded deed shows. The Manor at Flagler Village complex features studio, 1-, 2- and 2-bedroom-plus-study apartments featuring 10-foot ceilings, large balconies, and European kitchen cabinetry and granite countertops in the kitchens, according to the property’s website. Common amenities include a resort-style pool deck with hot tubs, a courtyard, grill area, club room, business center, gym, private dog park, and bicycle storage. The property also includes some retail space. It is close by to restaurants and shops on Las Olas Boulevard, the Fort Lauderdale Museum of Art and Fort Lauderdale Beach. Related Group paid $13 million for the land they built the apartments on in December 2011. In October, the TIAA-CREF controlled entity T-C The Manor LLP paid $52.1 million to acquire the Veranda townhomes and Manor apartments in Planation, which were also developed by The Related Group. The Related Group is not giving up on Fort Lauderdale, however. It is leasing the recently built New River Yacht Club and The Manor Lauderdale-by-the sea in Fort Lauderdale. Other Florida real estate interests of TIAA-CREF’s include a joint venture with APG Asset Management that paid $499 million to midcap real estate investment trust Taubman Centers in 2014 for a 49.9 percent stake of International Plaza in Tampa. That property includes a shopping mall and hotels located in Tampa’s business district, near Tampa International Airport. An affiliate of the Related Group received the highest score in the bidding to redevelop the Liberty Square affordable housing complex in Miami. Miami-Dade County has pledged $74 million in public support to replace the aged public housing complex in the Liberty City neighborhood with new homes and amenities that would support the community. The county received bids from Related Urban, the affordable housing arm of Miami-based the Related Group, and Bay Harbour Islands-based Atlantic Pacific Cos.
Related Urban’s site plan for Liberty Square in Miami. On Feb. 18, the county’s selection committee heard both proposals and gave Related Urban the edge with a score of 1,236, compared to 1,197 for APC. Now it’s up to Miami-Dade Mayor Carlos Gimenez to direct county staff to negotiate an agreement with the developer and send it to the county commission for approval. Liberty Square is located at the northwest corner of Northwest 62nd Street and Northwest 12th Avenue. One of the advantages of Related Urban’s plan is that the developer promised none of the current residents would have to be relocated from the property even as the building are replaced. That’s because the developer would fix up units there that are currently not inhabited. That would allow it to build more affordable housing on the Lincoln Gardens site in neighboring Brownsville. Under Related Urban’s plan, Liberty Square would get 1,332 new housing units. That would break down to 640 units of public housing, 120 affordable elderly apartments, 224 affordable family units, 288 workforce housing units, and 60 home-ownership units that would be for either affordable or workforce buyers. Related Urban would build 216 garden-style apartments there, with 105 of them public housing and the other 111 affordable housing. The Miami real estate boom extends west with CityPlace Doral, a live-work-play destination that’s redefining the industry’s mixed-use entity. 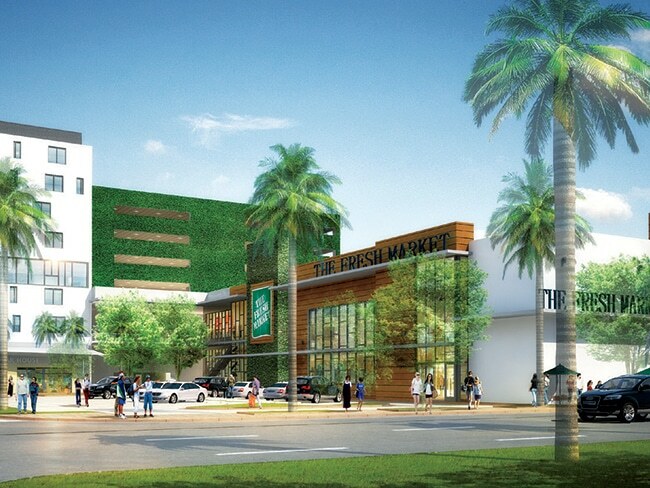 CityPlace Doral will feature the city’s only Fresh Market. The old days of mixed-use—just residential and retail—is so very 2014. Nowadays, developers are planning higher-octane versions of that, designing communities where people can live, eat, shop, unwind, work, and play, without venturing far. Like much of South Florida, fast-growing Doral is quickly becoming a place to do it all—all in one location. One of the catalysts is The Related Group’s upcoming $800 million CityPlace Doral, the latest in a string of mixed-use pearls—from the soon-to-be completed nearby Downtown Doral to Brickell City Centre and Paramount Worldcenter in Miami to Boca Raton’s Mizner Park, Delray’s Atlantic Avenue, and CityPlace West Palm Beach. These walkable “smart-growth” centers are redefining the region’s image as more than a retirement haven. “It enhances the reputation of South Florida as an urban destination,” says Al Zichella, Related’s vice president of development. Oval Fountain will feature music displays to delight patrons at 30-plus bars and restaurants. 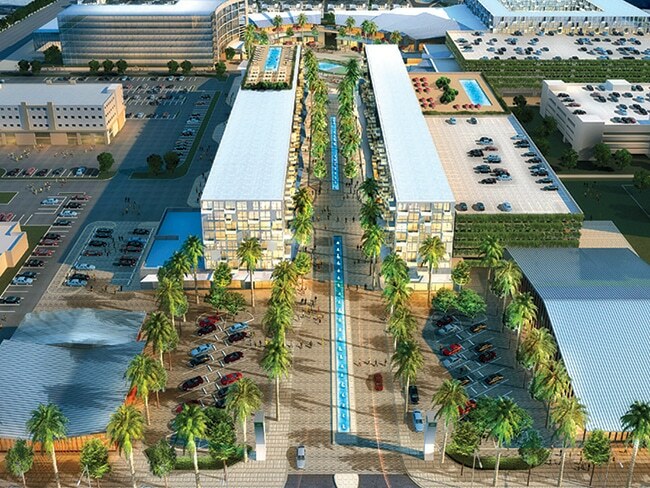 By day, 150,000 people head to jobs in Doral, a Westside business hub. Companies like Carnival Cruise Lines, Perry Ellis, and Univision make this suburban city, with more than 54,000 residents, a prime setting for mixed-use development. The 600,000-square-foot contemporary entertainment and shopping mecca, designed by Arquitectonica, incorporates 1,000 new luxe apartments, condominiums, and single-family residences by Shoma Homes. Rendering of CityPlace Doral from above. Within walking distance is Oasis Park Square, a new, gated million dollar-plus community of 150 modern homes, and CityPlace Doral’s The Manor, a 385-unit luxury apartment building with amenities like a yoga and virtual spinning room, a Zen lounge, a three-hole putting green, and a dog park. At press time, CityPlace’s retail space is already 60 percent pre-leased—and that’s just the start. 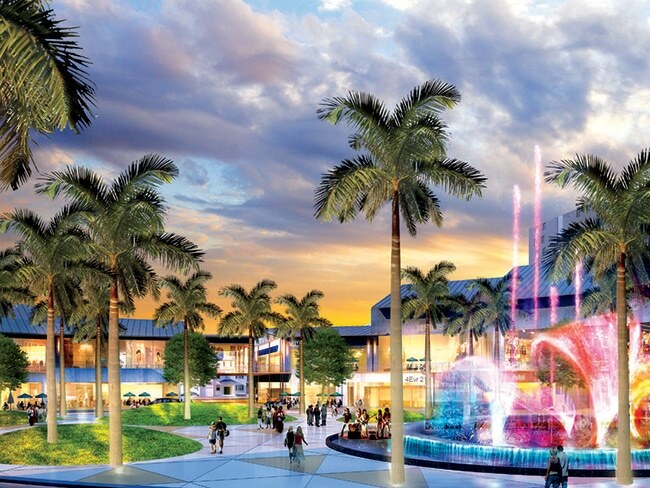 For Doral, it seems, this next-wave of the mixed-use mega-project is a winning combination.